New World Tortilla is finally open! The now take cards and they have coffee. Bueno Y Sano is the new burrito player in town. An article in local paper Seven Days had a write-up on their arrival. As noted in the article, this is the third Bueno Y Sano (good and healthy in Spanish) location to open; the other locations are in college towns in MA. 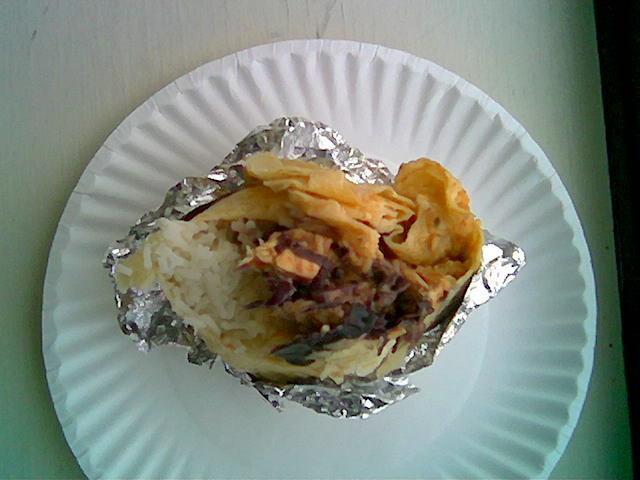 I too decided to try Bueno Y Sano’s Thai Chicken Burrito, but I came to different conclusions. 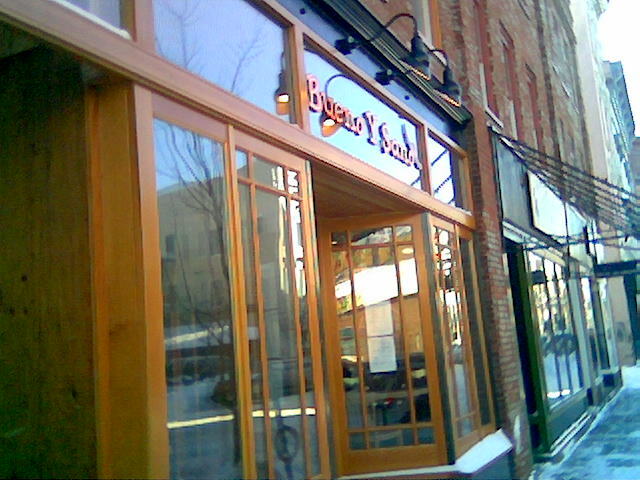 Bueno Y Sano – Replaces the sorely-missed Auggie’s Island Grill on College St in Burlington Vermont. The interior is very nice, they commissioned an artist to help with the aesthetics. 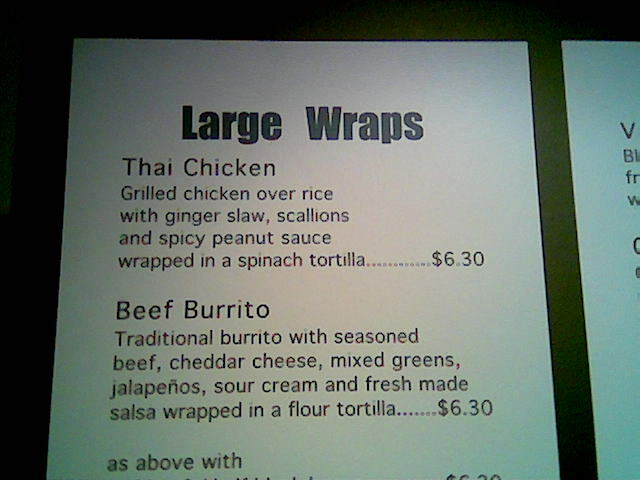 Bueno Y Sano, Thai Chicken Burrito (grande) – You have the option of ordering any of the wraps as a “grande”. 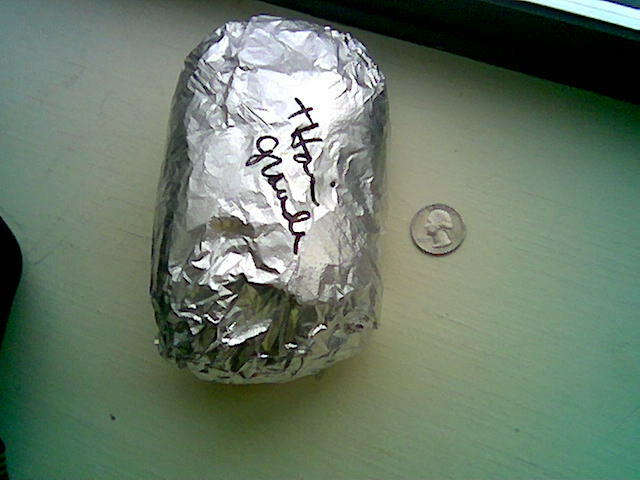 Grande pictured, the normal size is roughly the size of a huge baked potato. Bueno Y Sano, Thai Chicken Burrito (normal size)- Marinated grilled chicken, Basmati rice, red cabbage slaw, and spicy Thai peanut sauce. The wrap is almost in a ball shape (they tuck both ends of the wrap) which is unique. Immediately there is a nice coconut, mint?, Thai red pepper flavor from the sauce. 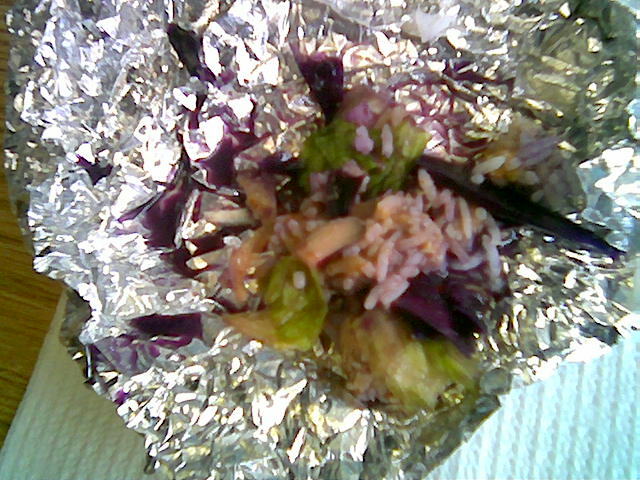 The red cabbage is nice and crunchy, the chicken is breast meat, the basmati rice was an interesting choice. However I normally associate jasmine rice with Thai food (a la New World Tortilla’s version, the basmati was nicely steamed but the choice of rice threw me off. Also noticeable missing from the sauce was peanut, this Thai sauce appears to be primarily coconut based. I was worried about the wrap disintegrating, but it held together well. Since there was a real dearth of peanut butter in the sauce, I decided to try the grande Thai Chicken Burrito a second day to be sure it wasn’t a fluke. Because of the roundish shape of the burrito, the grande size means that you’re going to have bites that are all one ingredient. I confirmed that there is a lack of peanut butter in the sauce, and was disappointed that the wrap was so sweet, despite being excited about possibilities of coconut and mint in the mix. Also, inexplicably there was romaine lettuce and sauteed spinach in the large version of this wrap, which was not advertised on the menu. Finally points off for not draining the cabbage this time around. 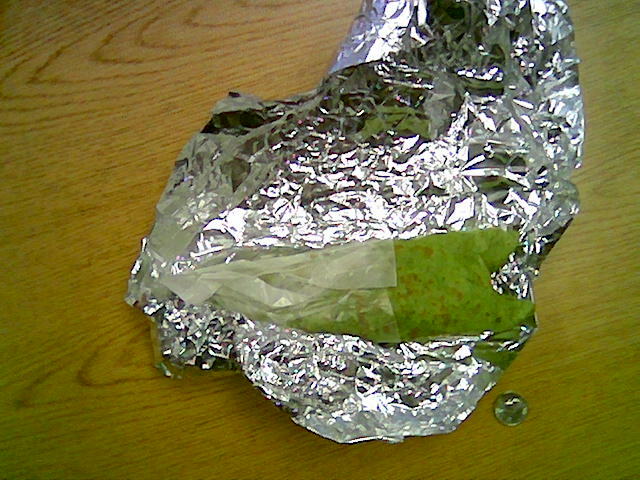 My hands were covered in red cabbage juice, and as noted in the picture the wrap just fell apart at the end. So if you order the Thai Chicken Burrito, order the normal size, and be prepared for a heavy coconut, faint peanut flavor. The normal size is $7, and the grande is $7.50, a filling-inexpensive lunch, but I don’t think I’ll order the Thai Chicken Burrito again as I know a better version exists. 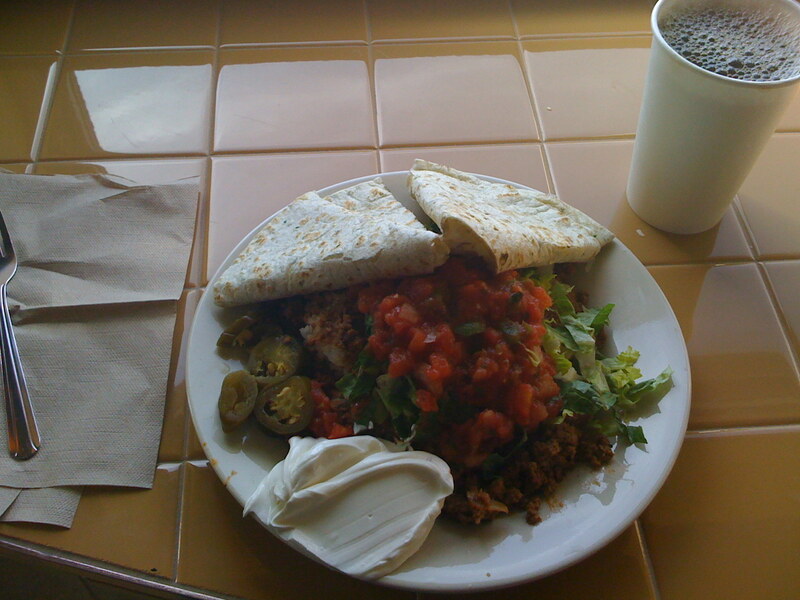 I will however be back to try some other of their menu options, which seems to be one of Bueno Y Sano’s strong suits. The Thai Chicken Wrap is currently my favorite thing to eat for lunch. I order mine with extra scallions (no charge). 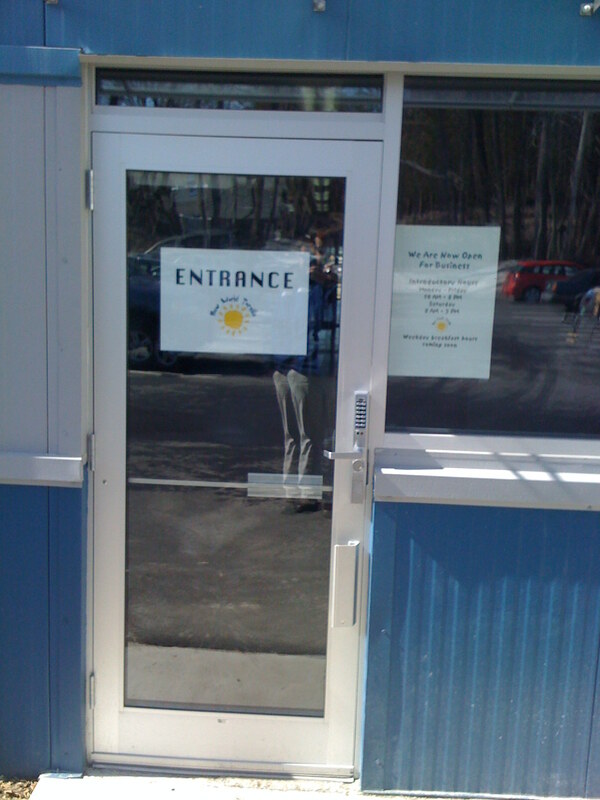 Speaking of charge, bring cash, as New World Tortilla is cash-only. 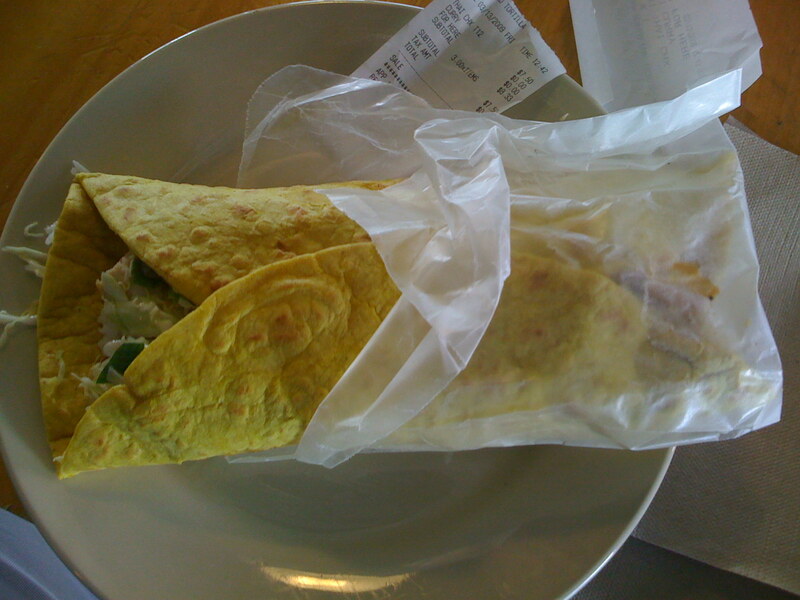 As mentioned in my chicken salad wrap post, The classic New World toasted tortilla. This tortilla is spinach, which doesn’t impart too much flavor, but is nice visually. Strips of grilled Chicken breast, toasted spinach tortilla, (fresh) ginger slaw, scallions, spicy peanut sauce (with Thai red pepper flakes), and finally jasmine rice (from a rice cooker). This wrap is tremendous, it hits all “5 tastes”, you want to keep eating it to get the balance of all of the flavors and textures. 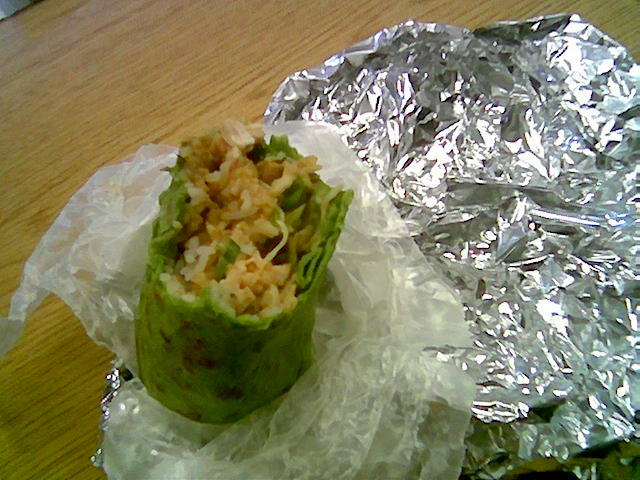 This wrap made me realize that I love jasmine rice, and confirmed my love of peanut butter. It’s also tremendously large, and eating the whole thing may result in feelings of accomplishment, or possibly slight food-coma. The only slight unavoidable issue with this wrap, it that the very bottom of it starts to get a little soggy, meaning the end of the wrap can be a little messy. So good, and a great value!